currently researching marine education in Australia and the Pacific as part of his PhD while being the co-founder and Director of the Euakafa Island Research Centre. While he is a relatively recent convert to the art of underwater photography, his 22 year marine career and over 4000 dives means that he knows where to look for inspiration. His photos have won or been placed in numerous international and national photography competitions and used in publications ranging from online journals, articles in magazines, books and exhibited in galleries. He is a passionate conservationist and believes that photography is an incredibly powerful communication tool for any conservation campaign. His wildlife photography is deeply personal and his genuine love of, admiration for, and wonder he feels for the animals he encounters - both under and above the water - is clear in all his work. He is currently lecturing at Monash university's Education Department, RMIT University teaching marine biology for their winter program and NMIT teaching Molluscan Aquaculture to 2nd year undergraduate students. 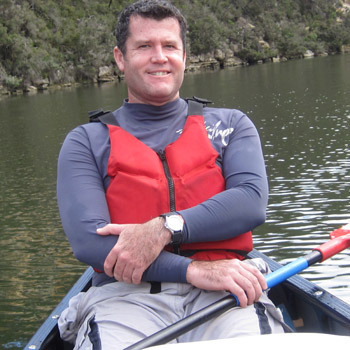 He has worked for the United Nations, New South Wales Fisheries, commercial pearling companies, NGOs, private consulting, Department of Education and Early Childhood Victoria, and various SCUBA diving companies as an instructor. His work has taken him throughout South East Asia, around Australia and much of the South Pacific while his current research takes him around the world presenting at academic and conservation congresses.